I haven't been on the forums much lately, I see your sig says 919T. Are you liking them better than CB's (I think that's what you had)? Man I wish I had the game to play them day in and day out because they are beautiful. Also TS3 Ahina combo, is it working out well? 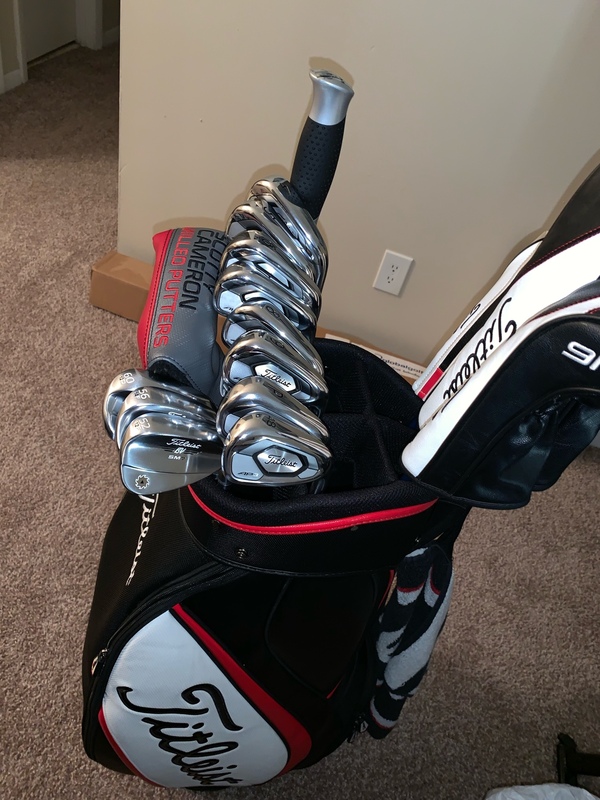 Just actually got the 919T and wedges yesterday. had placed my order a while back and things just came in. 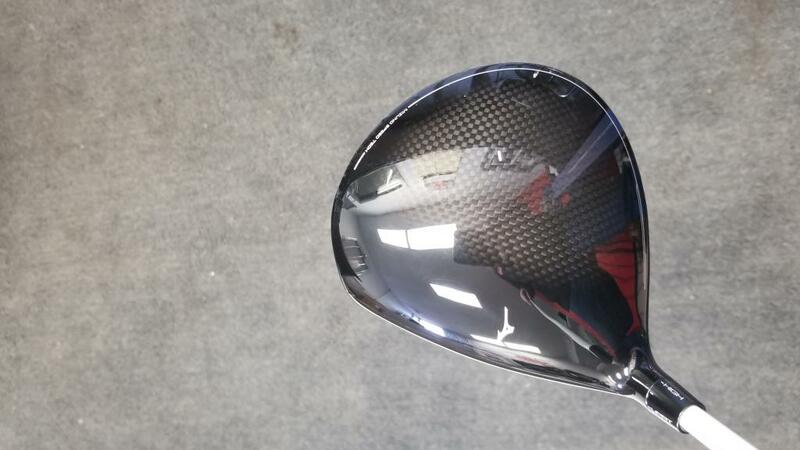 I hit the irons and gap wedge on the range yesterday (yes in 37* weather) and was carrying them just as far as I was hitting my 716cb's in 85* weather, and more accurately. couple additions to the bag. Clubs should be here on or around February 15th. Still getting used to the 919's. Much higher flight than I am used to coming from 716CB's with X100's. The wedges are phenomenal. I love the feel of the S18 over vokeys. I've only got 2 rounds in outside with the Mizzy clubs. It turned cold here fast and I'm not in a hurry to swing a club in -5*F. 3 simulator rounds and they have performed well. Granted it's a simulator, but shot 73 and a 72 at bethpage black, then an even par 72 at Torrey pines. Anyways, putting some $ aside for a new staff bag for 2019 now. 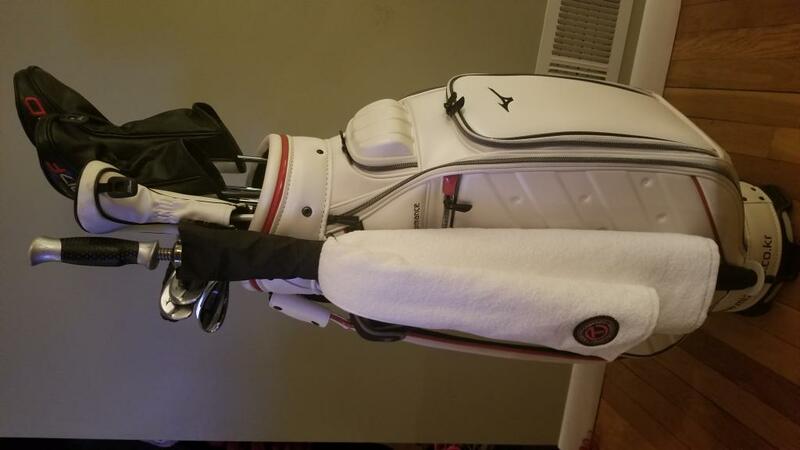 New bag, new towel and some new sticks to show off for the start of 2019. Driver has not yet arrived so the trusty 917D2 is a place holder currently. That's a good looking bag. Love my mizuno wedges too. Need to be replaced, can't find anything I like. But I have yet to hit the new mizuno offerings. Too cold,& too much snow in upstate ny these days. As you know. A little teaser this past week thinking early spring. But today shot that down. Indoor simulators have "scratched the itch" so to speak a few times this winter, although I did manage to play outside 2x in December. The bag I found online.. it's a pearl white with red and carbon fiber accents. Really a sharp looking bag, and when I was surfing looking for one to replace my old Titleist staff bag, this caught my eye and I knew that was going to be the next purchase. Loaded up all the goodies in it tonight with a few odds and ends still left to sort through. Nice. I've played a few times indoors. Can't wait for the season to start. I've already registered a team for the annual Warren Washington ARC benefit tourney at Saratoga National. Love that tourney. Played in it the last 4 years. 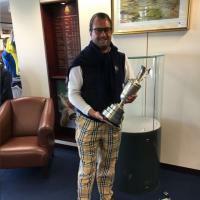 Is it possible to post in the forum without guys telling the poster he is playing the wrong clubs, the wrong shaft, or in this case the wrong ball? Ive got a good long list of tournaments I intend to play this year. NYS Am, NYS Mid-Am, Saratoga County, Schoharie county and Rensselaer county Ams, a couple club championships, the NYS 4-ball at Leatherstocking and there's a couple others that I plan on looking into as well. I only play maybe 2 scrambles a year but they're a good way to unwind with buddies for sure. Good looking bag. Might have to change your screen name with all the mizuno product you have in there. I'm not a fan of scrambles either. Scrambles are always filled with liars & cheats. I just go to have a good time. Usually it's some sort of benefit fund raiser. So to me it's not about winning, it's about donating. Had a little time today to head to the range at northway 8 and hit a bucket. 43* outside, slight breeze across the range. Was carrying 9i over the 150 marker with crappy range balls. I honestly had trouble hitting my Titleist CB 9i 150yds in 80* temps downwind. These Mizzy 919's have impressed me so far. 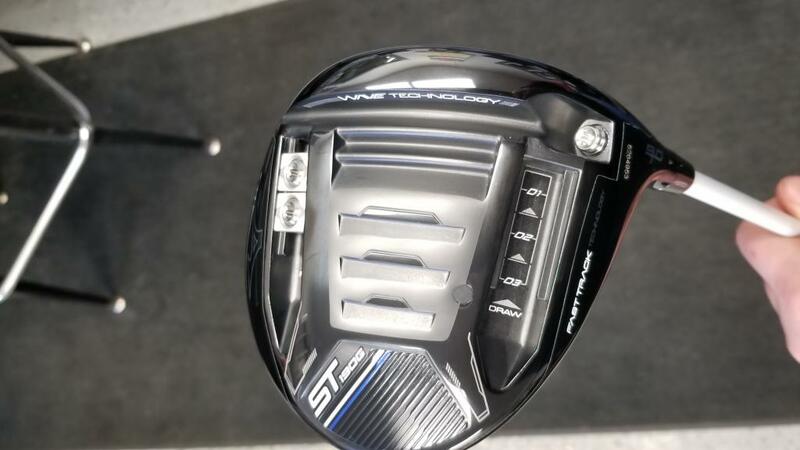 New driver arrived this week. Here's a couple pictures I snapped during unboxing. 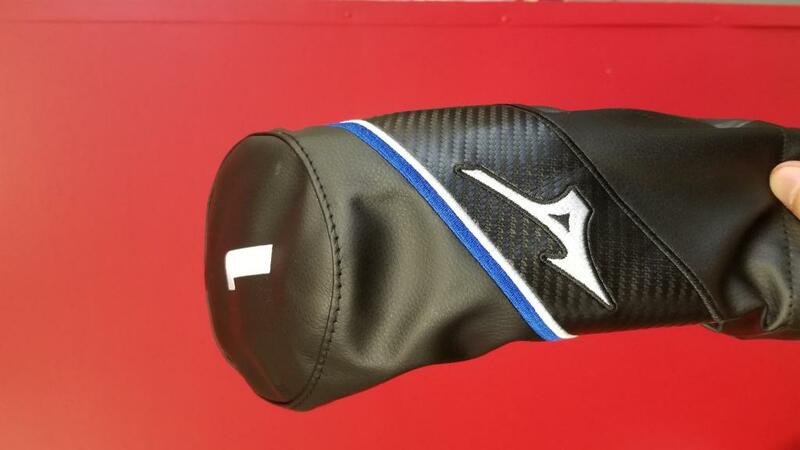 Looks sharp, going for a full mizuno bag soon? Should change the username lol! 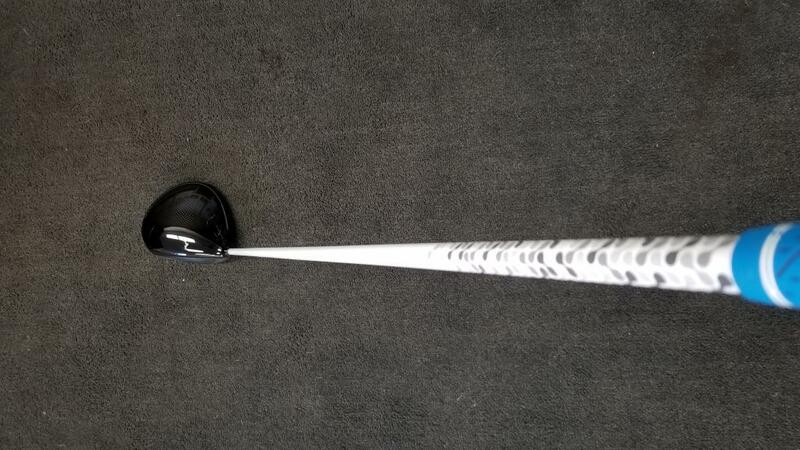 Cant kick out the 3w, hybrid or putter. They're just too good for me. I've still got my titleist clubs waiting in the wings in case the mizzys dont behave. Love my h1, though the ts2 3w kicked out my 917, just hit it better off the fairway and the sound is great! Are we really? Wtf! I've been thinking of driving down to exit 8 to hit a bucket.I've got to test the F9 outdoors to see if I'm keeping it or my G LST. But the **** weather doesn't seem to be cooperating. I'm ready for the great melt. Some nice new additions! Especially the bag. How is the new Tarks? I was thinking about playing there this past Friday or Saturday. 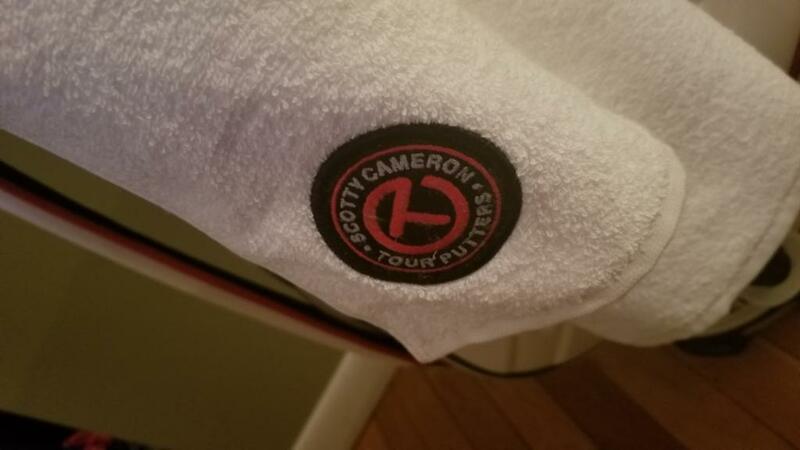 Just didn't end up going. A few new courses added to his list... pretty much the same sims and software. different location. parking is non-existent. They're going to have to address that somehow, because he's allotted like 3 parking spots and that's just not going to cut it. With the snow FINALLY melting....I had the chance to make it down to exit 8. Hit a large bucket & tested some shafts in my F9. I'm not sure it's going to unseat the G LST for top dog in the bag yet. Id go down tomorrow too, but rain is in the forecast. Next week looks promising. Stadium in Schenectady opened their grass range yesterday. Hit 2 large buckets there last night after work, and the wind was not helping. Into and right to left wind was a big hit to the ego, especially with 50* temperatures. Contemplating a change in iron shafts as well. The PX LZ 6.5's in the Mizzy's visually have a TON more spin than the TI X100's I've been playing. I'll give it a couple more range sessions before i pull the trigger on a swap. Nice! The mats at exit 8 are in horrible condition. Worn down the rubber, heavy grooves in the simulated "rough" . Wind didn't help sure, but made it fun trying to hit knock downs & work the ball with & against on the 1st day out. Some I pulled off, some I didn't. And most I just straight out pulled! Lol . I'll be heading down to stadium once it opens. Usually opens before courses up here do. We've now made it our annual 1st round of the year tradition. Plus we go down to support Jack. Maybe we'll see ya down there.